1) Dana Woldow did the math on bake sales and, well, they don’t add up: Do School Bake Sales Really Bring in the Dough? 2) If you have $11 or $18 burning a hole in your pocket, consider donating to give school supplies to needy kids attending Chicago Public Schools (through Groupon). 3) The country of Chile has banned all toys sold with fast food. What are your thoughts? 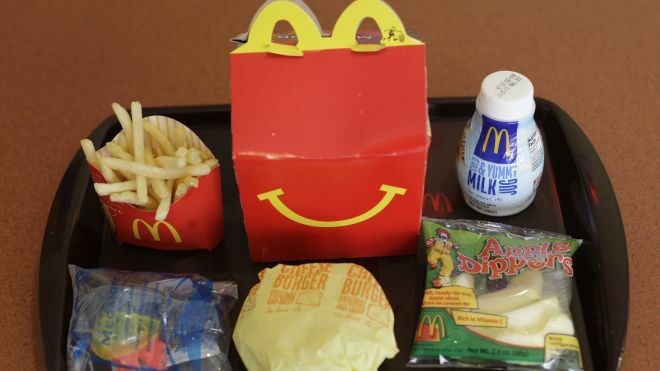 In regards to the banning of toys in happy meals…Since when are parents not responsible for what their children eat? It is not the toys that is bringing the children to the fast food chain, it is the parents. And if you are not comfortable with your child eating that food then do not bring them. It drives me crazy that all of this banning is going on. I do not want my child to eat greasy fast food everyday, so I do not make that an option. We make our meals at home because that is what I prefer he eats. It has nothing to do with whether or not there are toys in a happy meal or not. I agree with the post before me. It is up to the parents, they are the ones that keep bringing the kids back to the fast food places. I’ve been saying the same thing about bake sales for a few years now. Our school hasn’t had more than 2 or 3, so I think we are all in agreement there. HOWEVER, we are not allowed to ask point blank for money. The end. When Christmas and Valentines parties roll around, we can ask for donations of trinkets(junk) for goodie bags or money, ( no food) but we cannot set a specific amount, not even $1 from each family. I understand. There are families in our school without winter coats or running water at times. Others have more money than they know what to do with. So if a family buys a .50 bag of cookies, at least they are getting something in return rather than just giving away money. Slippery slopes…….